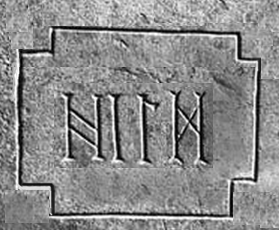 After discovering the Corpus of Anglo-Saxon Stone Sculpture I’ve been playing with Photoshop, imagining what Hild’s grave marker might look like. (This is just a first pass. It will end up looking much better when I’ve futzed with it.) This is adaptated from the Hildithryth stone found at St Hilda’s in Hartlepool. I hate to disappoint but Hilda's bones/removed were removed to I think either Glastonbury or The Golden Minster (St Oswalds) to escape the Vikings. It was moved late enough that they left the kings behind apparently. I believe she would have been buried within the church with the Deiran royal family graves. Do you know if anyone has dug at Glastonbury or Gloucester recently? No, I'm sure they would have been in reliquaries and probably destroyed at the reformation. Glastonbury is all tied into Arthur and the Wessex royal family. I seem to remember a medieval book/text called resting places of the saints that listed where the saints all wound up. I know Eanflaed got moved too. I'd love to get hold of that text–but even academic discussion of it seems to be buried behind myriad pay walls. Sigh.